Self-Driving Cars Could Ease Our Commutes, But That'll Take A While : All Tech Considered One of the promises of autonomous vehicles is that they'll reduce traffic jams. Self-driving cars will bring many changes, but traffic flows won't improve until enough human drivers are off the roads. 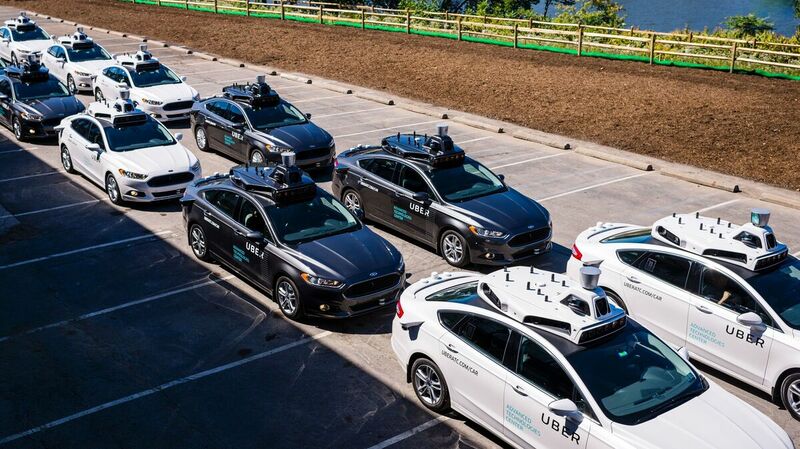 Pilot models of self-driving cars for Uber are displayed in Pittsburgh. Autonomous vehicles are expected to cut traffic jams, but not before enough human drivers are off the road. The promise of automated cars is that they could eliminate human-error accidents and potentially enable more efficient use of roadways. That sounds, at first blush, like self-driving cars could also mean traffic reduction and lower commute times. But researchers aren't so sure. Hesham Rakha is an engineering professor at Virginia Tech who studies traffic's flow — or lack thereof. Part of the fundamental challenge of traffic, he says, is it's extremely easy for human drivers to create traffic. "One little touching of the brake can pull the whole system down," he says. That's largely because of delayed human reactions. If a driver sees red tail lights and taps his brake, each subsequent driver approaching from behind also has to react, and that delay forces each one to brake harder than the next. Soon, you're at a standstill for seemingly no reason. The most minor disturbance like that can cost 10 to 20 percent less flow, Rakha says. "If we can prevent that congestion from happening, not only will we let vehicles travel faster, but we will also get more vehicles through our system." To demonstrate how automation might affect traffic, I met Rakha at a parking structure overlooking the intersection of Interstate 66 and the Dulles Toll Road just outside Washington, D.C., which is a well-known bottleneck that merges four lanes of traffic into two. Rakha has already collected traffic data from sensors on the road and designed an algorithm to calculate how real traffic might change as more self-driving cars hit the road. One little touching of the brake can pull the whole system down. Automation allows real-time traffic information to help cars anticipate what's ahead, then slow down to avoid disruptions, the way the right flow of sand won't overflow a funnel. It also helps that there is no reaction time in an automated car. Self-driving cars become synchronized. They communicate with one another, signaling disturbances ahead, and adjust to the optimal speed to not create a backup. In Rakha's simulation, as the number of self-driving cars increases, we can see how the red dots indicating congestion on the screen gradually clears and become green, moving dots. Geoff Wardle, director of transportation design at the ArtCenter College of Design, says he expects automated cars will lead to more ride- or car-sharing; or, they will park themselves. Either way, he says, "a significant amount of traffic congestion is caused by going around and around the same block looking for a place to park." But automation is not a commuter's panacea, either. The reason, ironically, comes down to human beings. "We tend to like to try to cheat the system to gain personal advantage," Wardle says. Basically the problem is this: Drivers might cut off driverless cars, screwing up their flow. In fact, Rakha's research shows it might take a while to see any improvements in traffic. That's because while the behavior of automated cars is predictable, that of humans is not. So it's not until enough driverless cars are on the road that we might see some easing of congestion. In the end, Rakha tells me he cannot predict whether automated cars will improve traffic congestion.